Cream pies are my favorite type of pie. This collection is brought to you by Foodie.com. All opinions are my own. 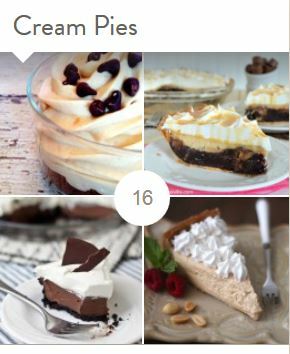 Since March 14th is pie day, it’s the perfect time to share this cream pie collection with you. Did I ever mention that I worked as a waitress at Baker’s Square for about 5 years? I had a blast working there and definitely had my fair share of pie-tasting. I quickly learned that my favorites all contained whipped cream. Anything with chocolate, peanut butter, cream cheese and whipped cream was pretty much irresistible to me. We categorized all the pies as either “cream pies” or “fruit pies”, and I could eat the heck out of the cream pies. In fact, it was a tad bit dangerous to work there with my sweet tooth! Now that I have been starting to experiment more in the kitchen, I am anxious to try making some cream pies on my own. There are so many delicious recipes out there and several seem a lot easier than I would have anticipated. It’s safe to say that we will be celebrating pie day on March 14th. I mean, who am I to ignore such an important day? 😉 We shall celebrate it to the fullest with at least one slice of a delicious cream pie. Here’s another scrumptious tip: Create a pie shake by tossing a piece of pie into the blender with a scoop of ice cream and some milk. Oh my goodness is that an indulgent treat! What is your favorite type of pie? Do you like cream pies or fruit pies better? I don’t eat a lot of pies but my kids love all types! Oh I LOVE cream pies! I love banana cream pie and chocolate cream pie the most! You had me at White Chocolate Pie, YUM!! oh you know the way to my heart….Cream pies! Yum! I adore cream pies! oh coconut and banana cream pies are awesome. Cream pies can not be beat, they are the best dessert. Oh yum! I’m going to bookmark this and save for summer. Looks delicious, I have seen a lot of posts on pies this week, I am in the mood for pie! Pretty sure my thighs expanded while I read this. Seriously, they all look so good. I don’t like meringue pies at all; my favorite is French Silk Pie. Yum….. I am definitely a cream pie type of girl. Peanut butter pie, and especially chocolate peanut butter pie, are my favorites. I really want one of those pie shakes now. That sounds so amazing! Cream pies for me! Or pumpkin with LOTS of whipped cream. The peanut butter chocolate mini pies look yummy. I like cream pies better than fruit pies. I like pecan pie the best. LOL! But these all look great. I saw salted caramel brownie cheesecake pie and lost control. MUST HAVE!! oh my goodness the peanut butter chocolate pie looks heavenly! I love cream pies and would love any of these for sure! The Salted Caramel Brownie Cheesecake Pie would be delicious! I definitely prefer fruit pie to cream pie, my favorite pie is apple pie. That doesn’t mean I won’t eat a piece of cream pie, I enjoy a good chocolate haupia pie (haupia is a hawaiian custard-like coconut dessert). Chocolate Haupia pie has a layer of chocolate and a layer of haupia and it is delicious. I think I want to try the Snickerdoodle pie first. Such yummy pie recipes. I want to try the Snickerdoodle pie first, then all the others. Wonderful recipes. I’m a big fan of cream pies myself. I’m not sure if it’s the filling or the crust that I don’t like. I’m thinking crust because I always prefer graham cracker crusts. I used to work at a diner that made the most amazing pb pie!! YUM! The salted caramel brownie cheesecake especially sounds to die for! And a pie shake sounds really good. I love Cream Pies! They are so delicious and there are so many here that I want to try to make this Spring and Summer. I like to make the cold cream pies, such as Chocolate or Banana Cream! I haven’t had too many cream pies in my lifetime, I grew up in WA so we always had apple pie when we had pie. My favorite pie is pumpkin(not sure what category that falls under).